On March 24, 1992, a fake inter-office memorandum purporting to be from New York Mayor David Dinkins was leaked to the press. A handwritten Post-it read “Thought you might be interested in seeing what the Mayor’s up to! ‘Mayor to Sell the Brooklyn Bridge!’ Think this will fly?? I love New York!! !” It was signed “J” (a.k.a. Joey Skaggs). The press jumped all over it, thinking they had received a communication from a mole. 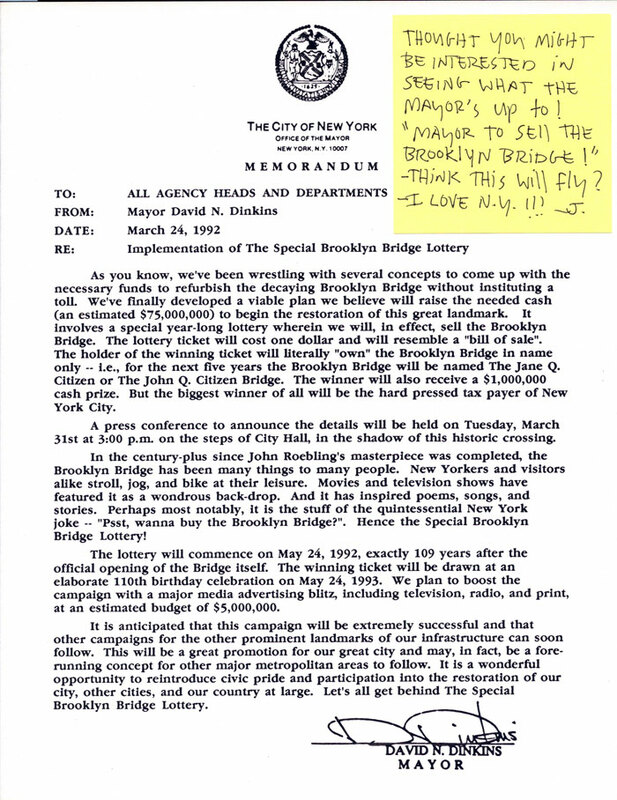 The Dinkins Administration, wrestling with a way to raise the necessary funds to repair the city’s decaying infrastructure, was apparently now instituting a lottery to sell the Brooklyn Bridge. In addition to a million dollar prize, the winner would have the bridge named after him or her for five years. After five years, there would be another lottery. And if the plan worked, other prominent landmarks would soon follow. The Associated Press put the story out on the wire service and the hoax went around the world. WABC TV, La Republica and Corriere Della Sera, to name a few, fell for it. City Hall was flooded with inquiries. 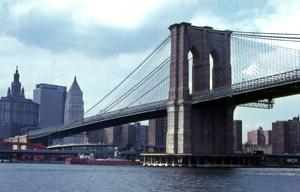 They, of course, vehemently denied that the Mayor was planning to sell the Brooklyn Bridge. None-the-less, a lot of people thought it was a great idea. An Italian publication suggested they might consider the same plan for the Ponte Vecchio in Florence.